Earlier this month, Canadian telco regulator CRTC denied a controversial site blocking proposal put forward by the FairPlay coalition. This came as a major disappointment to Bell and Rogers, two of the main proponents of the plan, who are now trying to tackle various piracy issues through a revision of the Copyright Act. The Canadian Government is currently exploring if and how the current Copyright Act should be amended to better fit the present media landscape. One of the key issues is the compensation that artists receive for their work. This was also the focus of a hearing before the House Heritage Committee this week, at which Bell (BCE) and Rogers both made an appearance. The companies are Canada’s largest Internet providers, but both also have their own media branches. As such, they have an interest in copyright issues, which they made quite apparent during the hearing. Bell and Rogers called for several changes to the Copyright Act to address the piracy issue. Interestingly, the proposals were identical on many fronts, with both companies highlighting how piracy is causing millions in lost revenue. 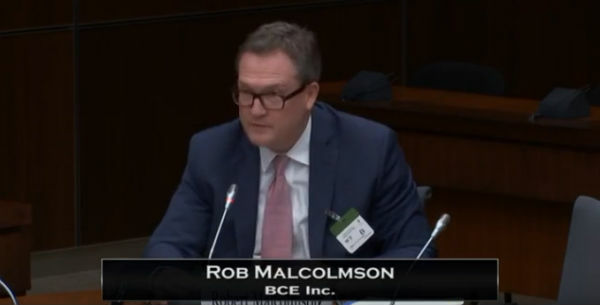 First up was Rob Malcolmson, Bell’s Senior Vice President of Regulatory Affairs. Instead of addressing artist compensation directly, he drew the focus to the “impact of organized content theft” instead. “This issue is fundamental to the topic the committee is studying because no matter what remuneration model you adopt, creators can never be fairly compensated if their work is being widely stolen,” Malcolmson said. 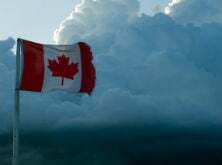 He went on to cite a series of piracy statistics published in recent years, including the increased popularity of pirate streaming boxes, and the fact that more than a quarter of all Canadians are self-proclaimed pirates. To address this rampant “theft”, Bell presented three recommendations. The first is to criminalize online streaming of pirated material. This doesn’t mean that any end-users would end up in jail, but it should act as a deterrent for operators of pirate streaming sites and services. Bell’s second suggestion is to get the authorities and public officials actively involved in anti-piracy enforcement actions. The UK and US were cited as examples where local police and special units help to deal with piracy issues. “We recommend that the government should create and consider enshrining in the Copyright Act an administrative enforcement office and should direct the RCMP to prioritize digital piracy investigations,” Malcolmson notes. Finally, Bell also reintroduces the piracy blocking proposal of the Fairplay Canada Coalition. The CRTC denied this application earlier this month, noting that it lacks jurisdiction. This is something the government could change through an update of the Telecommunications Act. Alternatively, website blocking could be addressed by an update to the Copyright Act, which would make it easier for courts to issue injunctions against ISPs and other intermediaries. This would simplify site blocking, but could also apply to search engines, hosting companies and payment processors. “In addition, a new provision could be added to the Copyright Act that would apply more broadly to intermediaries such as ISPs, web hosts, domain name registrars, search engines, payment processors, and advertising networks,” Malcolmson said. 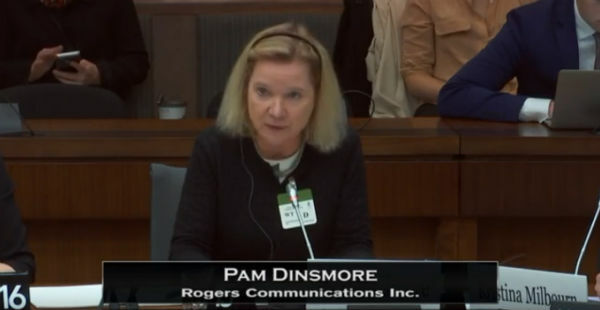 Following Bell’s testimony, the committee’s attention moved to Pam Dinsmore, Vice-President Regulatory, Cable, at Rogers Communications. She also stressed the importance of addressing piracy, mentioning various statistics and the rise of online streaming in particular. Interestingly, Rogers’ proposals to deal with this problem show a lot of overlap with those put forward by Bell. For example, the company also suggests criminalizing online streaming. “The Act should make it a criminal violation for a commercial operation to profit from the theft and making available of rights holders exclusive and copyrighted content on streaming services. In our experience, the existing civil prohibitions are not strong enough to deter this kind of content theft,” Dinsmore said. Rogers also raised the site-blocking issue. Specifically, it should be easier for rightsholders to obtain injunctions against intermediaries in the piracy ecosystem. This includes ISPs, domain name registrars, search engines, and content delivery networks. “For example, a rights holder should be able to quickly obtain an order from a court to require an ISP to disable access to stolen content available on pre-loaded set-top boxes without concern that the operation of section 36 of the Telecommunications Act might impede this effort,” Dinsmore added. While none of these suggestions directly impact the compensation of artists, which was the topic at hand, Rogers did present an idea at the end. According to the company, section 19.3 of the Copyright Act could be updated to change the current 50/50 royalty split between artists and labels to 75/25, favoring the artists. Not all members of the Heritage Committee were impressed by the idea, which comes at the expense of the labels, with some asking what Rogers was willing to hand out itself. 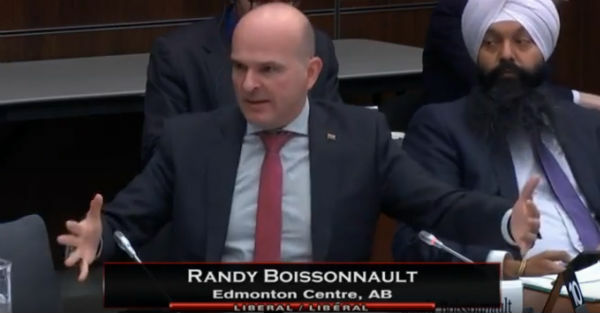 MP Randy Boissonnault, in particular, was not at all impressed by the telco’s proposals and stressed that the hearing was not the right venue to call for these changes. Even if the claimed $500 million in lost subscriber revenue could be recouped, artists would still get the same size of the pie, the Liberal MP noted. While Bell and Rogers likely hoped for a different response, and may not get what they want out of this hearing, it’s clear that their push for tougher anti-piracy measures didn’t end at the CRTC earlier this month. A full copy of the hearing is available through ParlVU.